"I thought I’d known what angry looked like on Black before all this. I hadn’t." Black takes Miri with him to New York, where he thrusts her into a world of Wall Street, talk shows, fancy dinner parties and being hounded by paparazzi. Although he’s playing the part of smirking Wall Street pirate, all of this is part of his new business venture, which, as far as Miri can tell, consists of hunting down and killing every single vampire in existence on Earth. Mostly, however, Black wants Brick. He flat-out won’t stop until he’s cut the head or heart from the vampire king who put him in that federal prison in Louisiana. Alarmed at the changes she sees in Black, Miri grows increasingly worried at the lengths he seems willing to go to bring the vampire kingdom down. Between his nightmares, mood swings, late-night disappearances, a new infatuation with swordplay, and outright lies, she can’t help worrying about his mind, too, and if trauma is fueling this obsession even more than anger. When a series of terrorist attacks take place in the southern United States and Black appears to be involved, Miri’s fears worsen. More and more, she starts to wonder who is hunting whom, whether Black is baiting the vampires into a confrontation or Brick is just manipulating him once again for his own purposes. 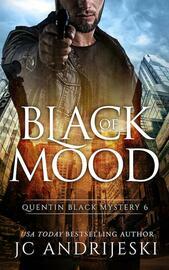 BLACK OF MOOD is book six in the QUENTIN BLACK MYSTERY series, a paranormal mystery series starring brilliant but dangerous psychic detective, Quentin Black, and his partner, forensic psychologist Miri Fox. It’s also a spinoff of the BRIDGE & SWORD SERIES. THE QUENTIN BLACK WORLD encompasses a number of dark, gritty paranormal mystery arcs with science fiction elements, starring brilliant and mysterious Quentin Black and forensic psychologist Miriam Fox. For fans of realistic paranormal mysteries with romantic elements, the series spans continents and dimensions as Black solves crimes, takes on other races and tries to keep his and Miri’s true identities secret to keep them both alive.